Dear moms who think I have it all together: Let me burst your bubble. The amount of new and expecting moms that email me for advice sometimes makes me embarrassed. At minimum it makes me shake my head a little and chuckle. I suppose having a blog where I largely write about motherhood must project some sort of an image in young women’s minds as to the vast amounts of knowledge and wisdom I surely have about parenting. Surely. And I try my hardest to be real with you. 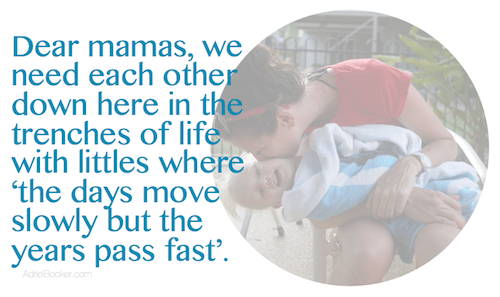 I have learned a lot as a mom and I’m so grateful for a place to share that with others. But I also have so much to learn, and I often feel needy as a mom – needy for help, for advice, for affirmation, and for encouragement that I’m doing a good job and that I’m not permanently messing up these little humans who trust me so well. Oh friends, if I wrote about every single insecurity and struggle and frustration and exasperated moment I have in my everyday life on this blog… I would probably send you running in the opposite direction. Fast. So hear me now, sweet mama-friends: I sometimes quietly judge other moms without meaning to or even realizing I’ve done so. I can be harsh and critical towards myself when I don’t live up to self-imposed (mostly unrealistic) expectations. I am sometimes slow to forgive my own mistakes. I have been known to seriously consider trading my kids in when it comes to the hours between 4:00 and 6:00pm. Sleep deprivation literally makes me lose my mind (and sometimes my keys). I have backtracked on parenting decisions I’ve been adamant about. I sometimes google about parenting dilemmas when I should actually be praying. At times I can be driven by a fear of what people think of my ability to mother, rather than what my heart tells me is right for my kids. I have moments of doubt, confusion, self-pity, and even outright apathy in regards to my mothering. I have days where I want to give up, days where I want a do-over, days where I want to run away, days where I want to ship my kids off to someone else to take care of while I get a “real” job (even though I know this one is more real and more right than anything else for this season of my life). And then there’s those days where I wish my kids would be into a twelve-hour movie marathon so we could veg out and eat snacks and never have to do pesky things like meal-making and spill-wiping, talking and actual playing. As much as I believe I’m the perfect mother for my children, I also sometimes shudder to think of how I might be screwing them up. I get fearful. I get anxious. I worry. I overanalyze. This, my friends, is why I need Jesus in my parenting. I sometimes feel that since I’m thirty-five I should well and truly feel like a grown-up by now. I should act wisely, plan carefully, choose discerningly, think maturely. And yet during difficult days I wonder how in the world anyone would think it’s a good idea to let this little girl have children of her own. Before becoming a mom I was at a place in my life where I genuinely believed that I had dealt with most of my major “issues”. Not that I had arrived at some ethereal perfection, but the major weaknesses in my life were known and being addressed and the major hurts or hang-ups from my past had been largely worked through. And then I birthed a couple of little teachers. My children are teaching me that I am vulnerable, weak, susceptible to pain and heartache and rejection and a whole range of insecurities. They are teaching me that I’m not as patient as I once thought I was. That I have fewer answers and more questions than I realized. That I still have blaring weaknesses. That I sometimes hunger for control and thirst for my own way. That I hold tightly to my rights and sometimes just plain struggle not to harbor sin in my heart. They are teaching me that my need for Grace is so much greater than I’ve ever understood before. I’m writing because, with all that I’ve learned in my short career as a mother, I realize that there’s a thousand times more yet to learn. I’m writing this because—just like the young mother on the other end of the email—I too need advice, encouragement, and true connection down here in the trenches. I’m writing this because we all need to remember that the woman parenting across from us likely deals with the same issues as we do. She probably sometimes feels at a loss for how to approach the third tantrum of the day before 8:00am. I bet she sometimes questions the nobility of her job as she labors over one more stinky load of grass stains and wet undies. She might feel guilty for yelling at her kids when she should have hugged them or for feeding them one too many chicken nugget dinners because that was all her weary arms had the strength for on a Tuesday. I’m convinced the best way to empower mothers—young or new mothers especially—is to be open and honest about the whole motherhood package – the wonders and joys and the absolute fun, as well as the heartaches and failures, fears and insecurities. If we want to empower other mothers, then we must be free within ourselves to share the journey. All of it. We just can’t do it well on our own. I will continue to share my journey as a mom – the fun parts, the silly parts, the beautiful parts, the frustrating parts, the embarrassing or even shameful parts, the heartbreaking parts, the triumphant parts – all of it. And I will continue to hope that this online space will make room for other women to be encouraged, find community, be resourced, and find validation for the hard, messy, boring, thrilling work of motherhood. Together we’ll figure out what we’re doing and learn from our mistakes and teach from our successes and we’ll celebrate the process. I’m with you, dear mama. I support you, dear mama-to-be. I need you, dear mama-who’s-been-before-me. I am you, dear mama-in-waiting. We need each other down here in the trenches of life with littles where the days move slowly but the years pass fast. Yes, we need each other. And oh mercy… do we need Jesus. Dear friends, are you guilty of putting other women on a pedestal in regards to how they mother? Are you guilty of judging them (positively or negatively) in ways that set them up to fail? Do you need the reminder today that we all struggle? That we all need one another? How are you purposing in your heart to empower another mom right now? This is really beautiful and encouraging. 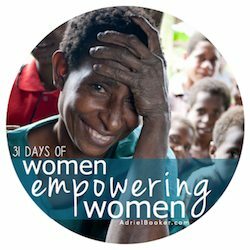 As part of my 31 Days series, I wrote a post on comparing ourselves to each other. It was tough to write because The Lord brought to light so much of the ugly in my heart. We try so hard to get it right. I find that this battle of not being content in my own parenting or being too prideful in what I know has hurt relationships around me. And that’s really heart breaking to me. So I’m on a journey of healing. It’s only the beginning. but the end goal is that I would be able to humbly serve and empower other moms. This is the first time I’ve checked out your site. I actually stumbled across it while searching for circus tent birthday tent ideas and found the lovely photos of your son’s first birthday! I’ll so be “borrowing” some of your ideas for my little girls birthday in a few weeks! Also loved this post. You are refreshingly honest about the trials and tribulations of motherhood as well as being so very grateful and happy in your role overall. It sums up my experience of motherhood perfectly. When I was new to being a stay at home mum I felt guilty for feeling so desperately bored to death with the menial tasks of motherhood – constantly changing dirty clothes, wiping high chairs, endless laundry etc. A few years down the track and another baby later, I’m in a much better place emotionally, and feel so priveliged to be able to stay home with my little ones while they still have so much to learn! Better go hang out some clothes before they start to stink and I have to rewash the load… Again! Between 4 and 6 pm? For me it is between 4 and 6 am! I love this. So encouraging and real. I have spent many days wishing that we could all be in a 12 hour movie marathon to…sigh…I am guilty of comparing myself to other Mums, often in a ‘they look like they have it all together why don’t I’ kind of thing…but then I remember that my good day is another Mums bad day..we are all on this journey together and I think Mothers uniting and supporting each other is so awesome. that’s such a great point – my good day is another mum’s bad day and vice-versa. thank you for that! this is such a good post. I know it is hard to spill the truth sometimes but it can be such a great encouragement to other mothers who are struggling through moments of complete helplessness and sometimes public embarrassment 😉 I had an almost 8 years old sitting on a table during a wedding eating her meat with her fingers while much smaller kids on the same table sat there eating in perfect manners quietly next to their parents..those are the moments I wish I could say..whose child is that anyways? p.s. levi sometimes whips his pants down at the park and starts peeing on a tree before i can stop him. WHERE DID HE GET THAT? seriously. it’s so embarrassing! hahaha!! Thank you for this! I’m so new at this, even though my little one is a 5 year old! 🙂 I also went into motherhood feeling pretty sure that most of my major issues had been dealt with, and that I was a pretty loving, compassionate and patient person…then my new teacher came along and showed me that in fact, I am not most of the above all of the time. I have so much to learn, and show much growing up to do. I’m so blessed to know others that are real and honest about the journey and help put my mind at ease that I am not the only one that feels like I’m the worst mother ever (even though that obviously isn’t true.) Thanks for the encouragement today. You’ve made me cry, and I don’t cry from blogs! I relate so much to your words (as do most mothers, the logical part of my brain suspects). I have had such a terrible weekend with my parenting, alternating between feeling like I am actually losing my mind and feeling like I’m ruining my children by my yelling, impatience, etc. 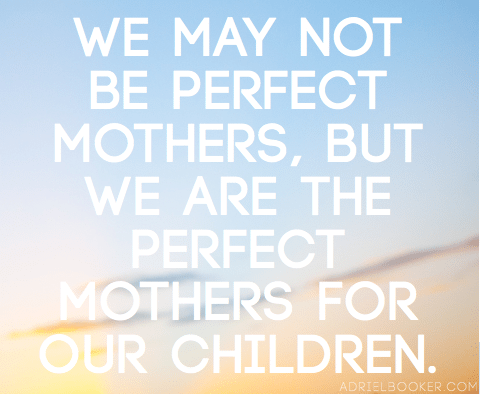 I am always feeling like all other mothers have it so together and are so calm and patient with their children, and I just find my children to be so difficult at the moment. I really feel quite alone. Thank you so much for this, I so needed it today.